First responders from numerous agencies were on hand for the ceremony on Saturday afternoon. RACINE – First responders and citizens came out Saturday afternoon to Party in the Park to remember the lives lost in the Sept. 11, 2001 terrorist attacks. The guest speaker — who was also the 2018 Party in the Park Parade Grand Marshal — was Alan Wallace. Wallace was one of three firefighters at the Pentagon when the American Airlines Flight 77 crashed into the western side of the building on Sept. 11, 2001. The Pentagon’s fire station was destroyed in the crash. Within 48 hours after the attack, Wallace scribbled down everything he remembered about it so he would not forget. He filled 17 pages. Wallace told the story of the events that day from his perspective. He remembered seeing the plane headed for the Pentagon. After the crash, he assisted fellow first responders to rescue as many people as they could. “It’s nothing more than what gets done every day,” Wallace said of his actions that day. Wallace is originally from Middleport and now resides in central Ohio. He served in the United States Navy starting in 1965 and served in Vietnam. Wallace has also worked for Grant Medical Center, Rickenbacker International Airport, and as a tour guide in Arlington National Cemetery. 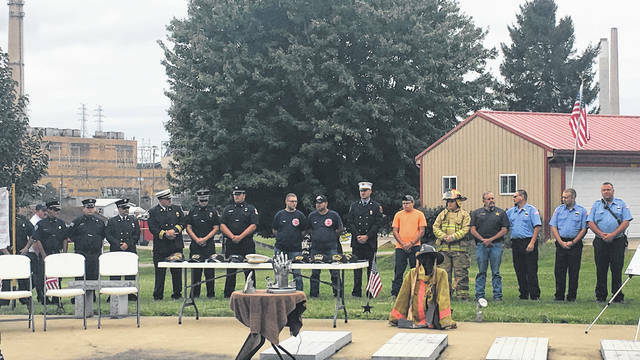 The 9-11 Memorial Ceremony is a tradition at Racine’s Party in the Park, paying tribune to first responders and military personnel involved in the rescue on 9-11, as well as those serving now and since that time. Local firefighters, law enforcement, emergency medical personnel and military members take part in the ceremony each year. Nearly 3,000 people died in the Sept. 11 attacks, when terrorists seized control of four planes. They flew two of them into the World Trade Center skyscrapers in New York, one into the Pentagon in Arlington, Virginia, just across the Potomac River from Washington, D.C., and a fourth was brought down in a field in Shanksville, Pennsylvania. 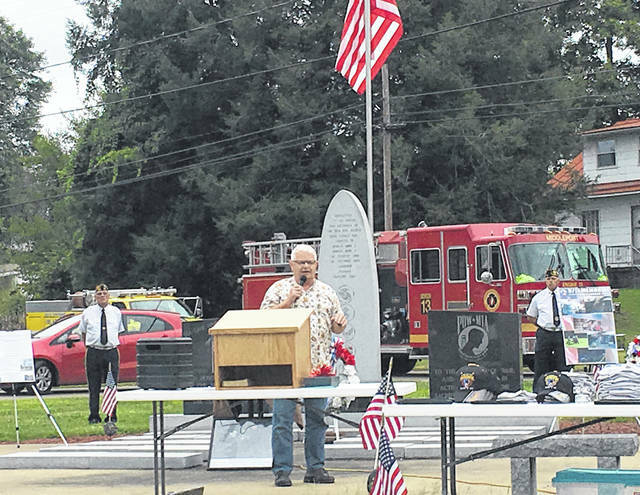 https://www.mydailysentinel.com/wp-content/uploads/sites/14/2018/09/web1_9.11-Memorial-1_ne20189101759660.jpgFirst responders from numerous agencies were on hand for the ceremony on Saturday afternoon.